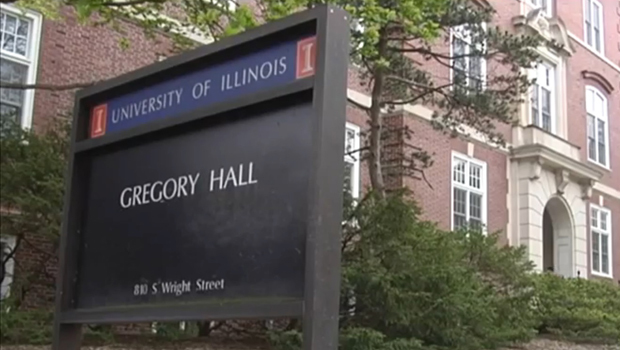 CHAMPAIGN, Ill. -- Police at the University of Illinois' Urbana-Champaign campus said Friday they are investigating the appearance of three large swastikas in campus buildings while administrators said an employee has been fired over an apparently unrelated noose left on a table in a work area. The roughly two-foot swastikas were drawn with markers Thursday morning in three campus buildings, CBS affiliate WCIA reported. Campus police spokesman Patrick Wade said police were still reviewing surveillance video but had not yet found footage of the images being drawn or gathered enough information to conclude the symbols were anything more than vandalism. "These were drawn in public areas in public hallways," Wade said. "It could have been anyone passing through those buildings." No arrests have been made. The swastikas have since been removed. Separately, interim Chancellor Barbara Wilson and other administrators said in an email to employees and students that a maintenance employee was fired after admitting he made the noose and placed it on the table on April 6. In the message, the administrators were critical of those responsible for both incidents. "We condemn acts like these that are intended to intimidate particular groups and do not advance legitimate discourse and debate," Wilson and the other administrators said. They also called for a "steadfast commitment to being welcoming and supportive of each other, and to demonstrating -- with our words and acts -- what it means to be a member of the Illinois family." "I think the important message is that we can't let these messages define us as a community," Wade told WCIA. "We have to stand up and say this isn't what we're about." The administrators recalled incidents earlier this semester that included anonymous Facebook posts criticizing "antiwhite racism" at the university and chalked messages such as "Build the Wall" and "They Have to Go Back #Trump" written on sidewalks outside the Department of Latina/Latino Studies. The chalked messages reflecting themes from Republican presidential candidate Donald Trump's campaign were similar to slogans found drawn at other campuses around the country.